Chardham yatra which is traditionally is undertaken from Yamunotri in the west to Badrinath in the east. An abode of Lord Vishnu. Placed at an altitude of 3,150 meters. Main languages spoken are Hindi, Garhwali and English. May - June and September - November are the best time to visit Badrinath. Summer season at Badrinath is pleasant at day and cold at night. winters season at Badrinath is very cold covered with snow and temperature dips to sub 0. Jolly Grant Airport at Dehradun is the closest airport. 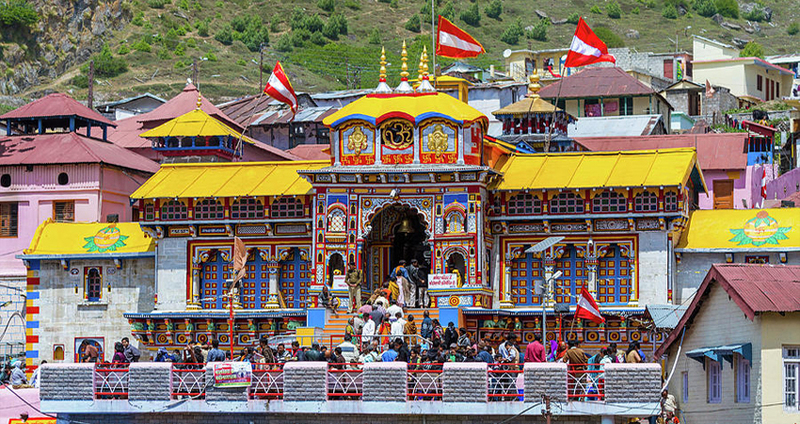 Badrinath was recognized by Adi Shankara in 9th century as a main shrine. Shankaracharya is measured as the guru who brought rebirth for Hinduism in that period, which was then conquered by Buddhism. His entrance at Badrinath brought a rebellion and restores people's faith in Hinduism. 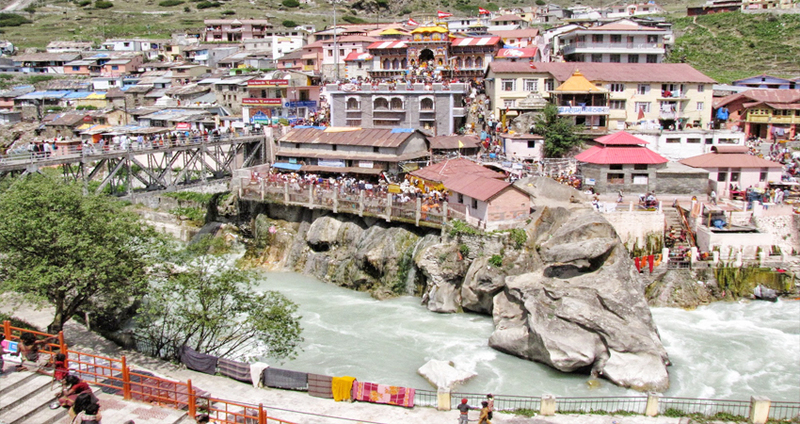 Badrinath temple can also be explained as the central attraction of the town. As per legends Adi guru Shankara found a black stone figure of Lord Badrinarayan in Alaknanda River. The stone was made of Saligram stone. Originally he enshrined the stone figure in a cave that was placed in proximity of the Tapt Kund. Later in 16th century, the King of Garhwal changed the murti to the current place. Since then the temple has seen various reconstructions. Wear and tear forced several modifications and altercations in designs. Kings of Garhwal expanded the temple region by 17th century. In the great 1803 Himalayan earthquake, the temple undergoes a lot of damage. But king of Jaipur then reconstruct it. Badrinath temple is about 50 feet big with a small cupola on crown. The roof is enclosed with gold gilt. The frontage is finished by of stone and has arched windows. There is a wide stairway, which guides you to a tall arched doorway. This gateway is the major entrance gate. The inner design resembles Buddhist vihara. With intricate carvings on the walls and pillars, the atmosphere in the temple is very great. Badrinath Tour is the shell of tempting destinations such as Har ki Pauri, Ganga Aarti, Deoprayag, Rudraprayag, Karnprayag and Tapt Kund, Narad Kund and etc. Badrinath tour will offer you extreme satisfaction and a great peace of mind. Badrinath tour starts from Delhi and then goes towards Haridwar, Joshimath, Badrinath, Rudraprayag and finally a return to Delhi. Arrival at Delhi Railway Station, drive to Haridwar, on the way lunch. Check in your Hotel. Visit Har ki Pauri for Ganga Aarti in evening time. Back to your hotel, dinner and night stay. Day : 2 Haridwar to Rudraprayag (165kms/6hr). Break of day visit Haridwar local sightseeing, afterward drive to Rudraprayag on the way visit Devprayag. Reaching Rudraprayag, Check in hotel for night stay. Day : 3 Rudraprayag to Badrinath (165kms/7hr). The ashram of Vishnu in the human world by year in the month of may, lord Badrinath himself come to earth for the good of mankind, the outstanding temple of Badrinath placed between the Nar and Narayan Himalayan mountains, with the banks of Alaknanda river at the height approximately 10000 meters, a black stone figure of is worshiped as meditating lord. Drive to Badrinath through Joshimath. Check in Hotel. At evening visit Badrinath Temple for Aarti and night stay. 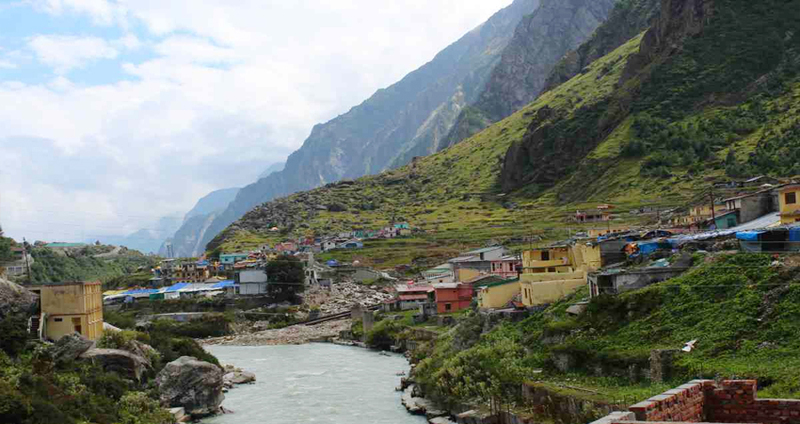 Day : 4 Badrinath to Rudraprayag (165kms/7hr). 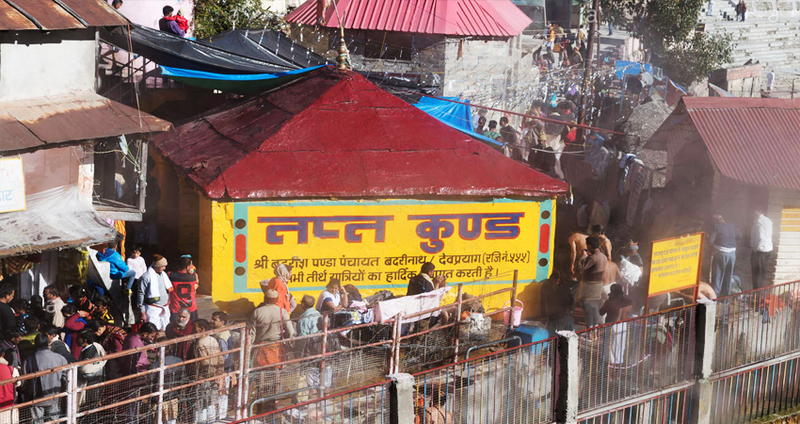 In morning time, pilgrims after having a bath in the Tapt Kund have the Darshan of Badrivishal. Brahamakamal is significant for Pind daan the ultimate Sharadh of ancestors. There is other places to visit such as Ganesh Gufa, Maatamoorti, Mana village, Charanpaduka, Vyas Gufa, Bhimpul and the "Mukh" of the Saraswati River. Just within the 3 kms of Badrinath. Afterward drive back to Joshimath. Check in hotel for night stay at joshimath. Day : 5 Rudraprayag to Rishikesh (144kms/6hr). In the morning time after breakfast. Drive back to Rishikesh. Check in Hotel. Overnight stay. Visit to Rishikesh and local sightseeing such as Triveni Ghat, Parmarth Niketan, Ram Jhulla, Laxman Jhulla, Shivananda and Gita Kutir. After Lunch, drive to Haridwar. Check in Hotel. Day : 6 Rishikesh to Delhi (230kms/6hr). After Breakfast, departure to Delhi. On reaching Delhi, Drop at Railway Station/Airport . The everyday ceremonies at the Badrinath temple begin early in the morning, just about 4.30 am with Abhishek puja, and last part at just about 8.30 -9 pm with the evening Aarti. The temple releases for Darshan for the general Yatri's around 7 A.M to 8 A.M and there is a day break between 1 to 4 pm. The Rawal of the temple performs the rituals. 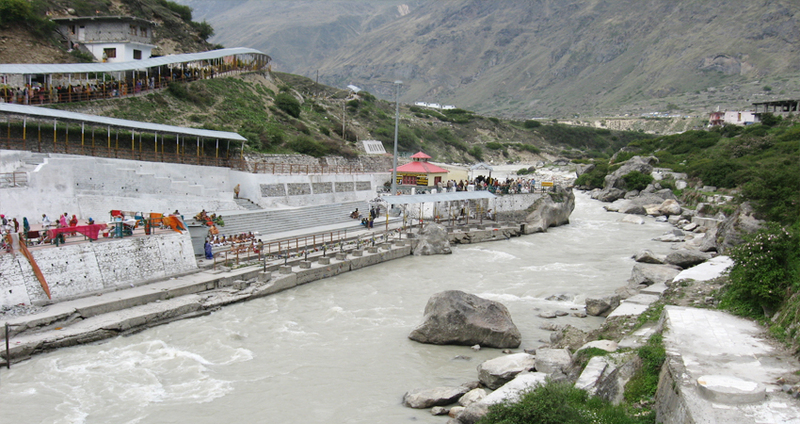 Chardham is usually visited by the pilgrims but there is no dearth of exploit lovers visiting this place. They visit this place for to sake of tour and totally get enthralled by the beauty and magnetism of this place. There are lots of places for visitors in Badrinath. Although there is Tapt Kund, Panch Shila, Vasu Dhara Falls, Laxmi Van, Bheem pul, Satopanth, Narad Kund, Swargarohini Brahma Kamal for pilgrims, simultaneously there is Vasudhara fall and Neelkanth Parvat. 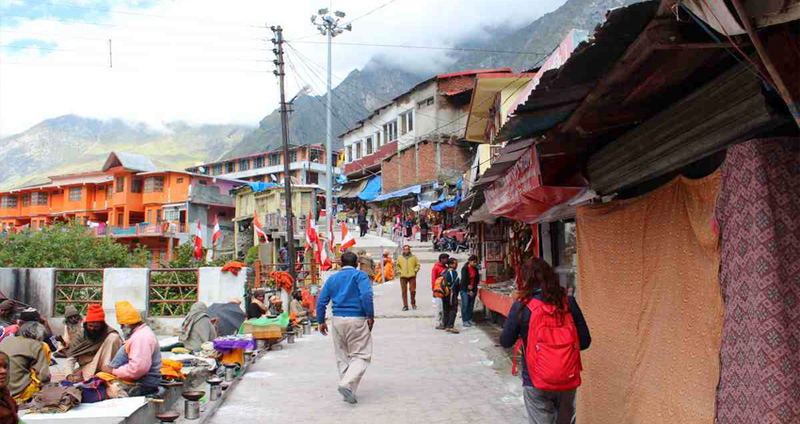 Yatra to Badrinath place is so difficult that sometimes it becomes not easy for people to venture out for this Yatra. Devotees who to take off from the unwieldy travel procedures should prefer Badrinath Yatra by helicopter. Nowadays, one can also get helicopter services to visit Badrinath site in same day.